Are rosy cheeks making you feel less than jolly? People make think you’re constantly embarrassed. But as rosacea sufferers know, that perpetual pink hue, known as “flushing,” is a symptom of rosacea, a skin disorder that inflames and dilates hundreds of tiny blood vessels near your skin’s surface. 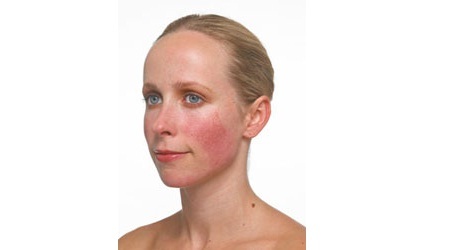 Rosacea is a distressing condition that affects mostly middle-aged adults of both sexes. It looks very similar to acne. Dilated, spidery red blood vessels appear on the face, which assumes an angry, flushed appearance that is very noticeable. It can trigger conjunctivitis and cause the growth of blood vessels into the corners of the eyes. It particularly affects the nose, changing the texture of the skin there, which can eventually become thickened and pitted. There is a tendency for the affected person to blush and the affected area gradually becomes redder over a period of time as the blood vessels dilate. The cause is unknown but it is not thought to be hereditary. The main triggers are extreme temperatures, sunlight, spicy food, alcohol, and hot drinks, all of which should be avoided to try to moderate the condition. 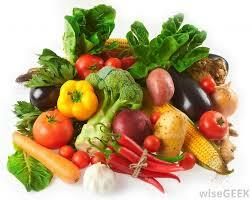 Diet: Those with rosacea have been shown to have a compromised digestive system. Having freshly squeezed vegetable juices every day is a good way of making sure you get the essential nutrients directly into your system. Skin eruptions occur if your body has no other way of eliminating toxins from the system. Eat plenty of fiber, especially from whole grains, vegetables, and fruits, to keep your digestive system clean and free of toxins. Cold-water fish are high in essential fatty acids, which have anti-inflammatory properties. Eat salmon, herring, and mackerel two to three times a week. Avoid foods that may make you flush, such as spicy food, caffeine, and alcoholic drinks. Avoid food allergens that may mimic the symptoms of rosacea and cause inflammation. The most common food allergens are dairy, wheat, corn, soy, and citrus foods. Supplements: Taking B-complex vitamins (especially riboflavin) daily to compensate for a deficiency in B vitamins which is commonly found in people with rosacea may be effective. Vitamin B12 helps to reduce flare-ups of rosacea. Be sure that this is included in your B-complex. Vitamin C and flavonoids are well-known nutritional necessities for optimal performance of blood vessels, capillaries, and connective tissue. 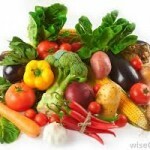 Vitamin C and flavonoids taken daily will be beneficial. As well, Probiotics help improve digestion and skin health. Get a good quality product that is kept in the fridge and take it with a meal. These micro-organisms provide acidophilus and bifidus, friendly bacteria that promote good health to your gut. Studies show that the digestive system in some patients with rosacea has low amounts of both stomach acid and the pancreatic enzyme lipase. Therefore, taking these digestive enzymes with each meal may help. Oregano Oil: There are many volatile oils in oregano with a variety of antibacterial and antifungal effects, which may account for its ability to improve symptoms of rosacea. A drop or two of the oil can be massaged into the affected skin once or twice daily. However, given that the skin of the face is often delicate and sensitive, it may be more tolerable to apply a cream or ointment that incorporates oregano oil. Any topically applied essential oil has the potential to cause dermatitis so discontinue use of any redness, swelling, itchiness, or pain develops. People that are sensitive to other plants in the mint family may also react to oregano. 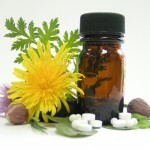 At K-W Homeopathic Medicine we are dedicated to providing your skin with only the most pure and natural ingredients. Our facials are 100% non-toxic making them a perfect option for people with allergies, chemical sensitivities and those wishing to avoid harsh chemicals found in many beauty products. 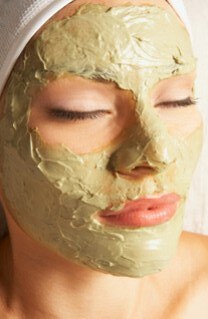 This facial is made from Bentonite clay, which has a reputation of being an amazing skin healer. It not only has the ability to absorb and remove toxins, heavy metals, impurities, and chemicals from the skin, it also works wonders on skin conditions such as eczema, psoriasis and rosacea by relieving itching, irritation and inflammation. 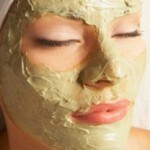 This facial will leave your skin feeling calm, supple and renewed. General Considerations: To minimize stress, which can cause flare-ups, take five deep breaths two to three times a day. You can also take deep breaths when you feel an anxiety attack coming on. Avoid sunbathing, hot baths, and saunas. The remedies suggested below can be used to relieve the symptoms of a recent, fairly mild episode of rosacea. 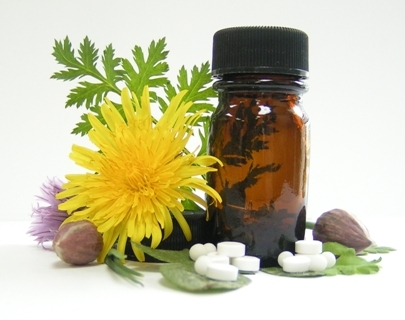 However, if your skin is subject to repeated flare-ups of symptoms over an extended period of time, it will be necessary to be treated by a homeopathic practitioner to treat the underlying weakness in the system that is giving rise to the symptoms. Belladonna: Use Belladonna if affected areas of skin feel hot and dry, and look bright red. Belladonna has a reputation for reducing inflammation and should be used at first sign of an outbreak of spots. Belladonna will either disperse the inflammation, or move it on to the next stage of pus production. At this point, a different remedy will need to be selected. 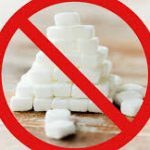 Nux vomica: If an acute outbreak of spots results from a highly stressful period of time, where your intake of alcohol, caffeine, and junk food may have increased, use Nux vomica. This is useful if the function of the immune system has been adversely affected by lack of sleep, and if you are consequently strained mentally and emotionally during the day. Lachesis: if the inflamed patches of skin have a dark-red, purplish look, and if the skin has a mottled appearance, use Lachesis. When this remedy is well indicated, symptoms are especially noticeable first thing in the morning. Rhus tox: This is the remedy to consider if spots are especially itchy and/or painful, and react very badly to contact with cold and damp. They may also show a tendency to be limited to, or worse, on the left cheek. The lips may also be noticeably dry and cracked with a tendency to develop cold sores. Sulphur: This is the most common remedy for skin problems, especially when they are accompanied with localized itchiness that is worse at night or after bathing. Prevention: Although not the cause, certain foods and drinks can aggravate this condition and are best avoided, or consumed only infrequently. The most common triggers include alcohol, tea, coffee, and spicy foods.